The next life you change could be your own. in your profession is key. The bachelor’s and master’s nursing degree programs at WGU are accredited by the Commission on Collegiate Nursing Education1. Motivated students are highly successful in WGU programs. 86% of WGU students are working full time. 86% say they were satisfied with the academic support we provide. And 95% who attend WGU say they would choose us again2. Continuing education is a healthy career habit. In the fast-growing, dynamic healthcare industry, a bachelor's or master's degree program can be key to your success. But you're also busy—too busy for school done the old-fashioned way. That's why WGU offers highly relevant online degree programs that are also highly flexible. You complete coursework on your schedule, and when you're able to learn material faster, you can finish ahead of schedule! 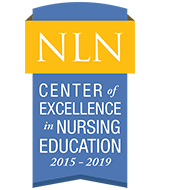 With quality as a focus, WGU is proud of its NLN Center of Excellence 2015-2019 recognition. Time: 84% of graduates finish within 24 months. Transfers: On average, students transfer 81 credits. With over 35,000 BSN alumni, this is one of WGU's most popular online degree programs. Locations: offered in CA, FL, IN, TX, and UT only. Tuition and fees: $5,445 per 6-month term. WGU offers the prelicensure program in areas where we have partnerships with healthcare employers to provide practice sites and clinical coaches to help teach you and inspire you on your path to becoming a nurse. Time: 81% of grads finish in 10–24 months. The online courses in this career-focused business degree program will prepare you with management-level skills and an up-to-date understanding of our healthcare delivery system. Time: 89% of RN-to-MSN grads finish in 1–4 years. Tuition and fees: $3,545 per 6-month term during undergraduate portion, $3,945 per 6-month term during graduate portion, plus one-time Health Professions Student Fee of $350. Given the growing nurse educator shortage, earning your MSN with a focus in education is both a rewarding decision and a solid career move. A master's in nursing education program for nurses with BSNs, this degree will prepare you to teach the future generation of nurses. Time: 77% of grads finish in 11–26 months. Tuition and fees: $3,945 per 6-month term, plus one-time Health Professions Student Fee of $350. Hospitals and other facilities need nurse educators. Earn your MSN – Education and step into a role inspiring and empowering caregivers. This program for RNs includes a BSN component and is a substantial leap toward becoming a nursing leader. If you're driven to lead, this online nursing degree will provide you everything needed to make that career a reality. This program is not the only degree WGU offers designed to create leaders in the field of healthcare. Compare our health leadership degrees by clicking the button below. Time: 91% of grads finish in 14–32 months. The Bureau of Labor Statistics projects employment of medical and health services managers to grow 17% by 2024, much faster than the average for all occupations. The trajectory of data and informatics in healthcare will continually open opportunities for registered nurses who take this path. Time: 93% of grads finish within 15 months. 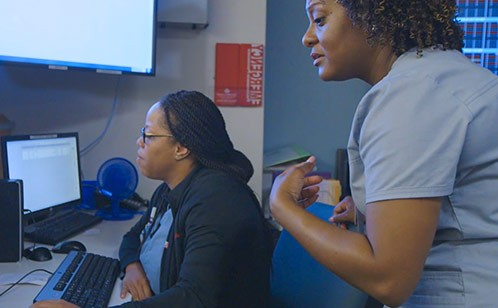 The trajectory of data and informatics in healthcare will continually open opportunities for nurses who take this path. A master's focused on managing comprehensive, value-based care, directly in line with innovations in health and healthcare. Time: 68% of grads in similar programs finish in 6–24 months. Your rich experience in a health-related field can mean more when you bring a master's level of understanding to the problems that organizations need to solve. Prepare for a career leading private or public healthcare organizations. Time: 79% of grads finish in 11–24 months. and many other executive-level roles. Healthcare is big business in today's complex economy. Steer your career with this specialty MBA. This program is not the only online business degree WGU offers designed to create leaders in the field of healthcare. Compare our health leadership degrees by clicking the button below. The healthcare industry demands more from employees than ever before, driving nurses and health professionals to earn additional credentials. WGU's online health and nursing degree programs are developed to address those market needs. These are just a few of our most popular healthcare online degree programs. Special offers, available for a limited time. WGU Loves Nurses Scholarship. Apply by June 30. 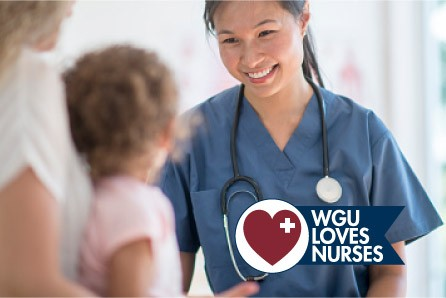 In celebration of National Nurses Week 2019, we’re offering the $2,500 WGU Loves Nurses Scholarship! This scholarship can be applied toward any bachelor’s or master’s degree from our College of Health Professions—and 300 scholarships are available. Paired with WGU's university-wide accreditation by the Northwest Commission on Colleges and Universities (NWCCU), these accreditations assure your degree will be highly respected. Our partners are among the leading healthcare organizations, including HCA, Tenet, Cedars-Sinai, Kaiser Permanente, and more. Knowing the quality education their employees will receive at WGU and the level of preparedness their baccalaureate and master's-prepared nurses bring to work, these partners trust WGU to support the future of their workforce. The Online Learning Consortium’s Digital Learning Innovation Award competition recognizes exemplary faculty-led teams and institutions for advancing student success through the adoption of digital courseware. WGU has improved student outcomes by implementing a specialized course that focuses entirely on the affective domain—the soft skills—of learning. Yovaletta Sullivan tells all of the nurses she works with, "It's time to go back to school, and WGU has an option for you where you can really do it." She understands why facilities want baccalaureate-prepared nurses and found WGU made going back to school completely doable for her—even as a full-time working mother. Hear the reasons why Yovaletta chose WGU first for her BSN, and again for her master's degree. Inspiring, helpful resources for aspiring and current nursing leaders. To ensure our online nursing programs and health programs are consistent with the expectations of today's healthcare strategists, transformational leaders, innovators, and employers, we develop our courses with input from councils composed of nationally recognized experts in their respective fields. Council members offer guidance on key competencies to be expected from successful WGU graduates. "WGU helped pioneer competency-based education. Coupling this with online courses has resulted in a nimble, contemporaneous education process that prepares its graduates to succeed while aiding the rapid evolution of the delivery of healthcare." "WGU focuses on preparing students not just for the current market demands, but also for the exciting positions that will be required in the near future to solve complex healthcare industry problems." 1. CCNE is located at 655 K Street, NW, Suite 750, Washington, DC 20001, 202-887-6791. 2. Results from a 2018 Harris Poll Online survey of 1,374 new college graduates nationwide with a survey of 1,147 WGU graduates.